Parking area and trailhead are on Rt. 302 in Hart's Location, NH (cascades are in Livermore), 17.7 miles south of Rt. 3 and 11.3 miles west of Rt. 16. The Nancy Pond Trail is an excellent, all-encompassing hike. 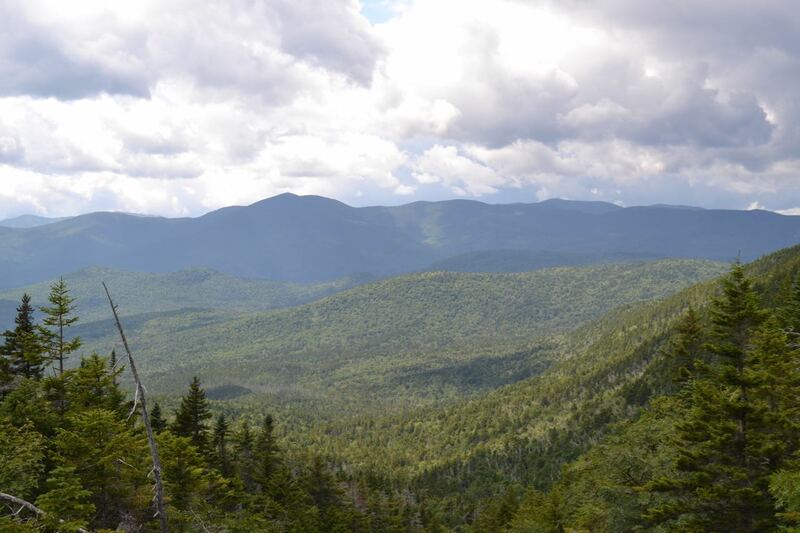 This wonderfully scenic trail pleases all White Mountains explorers, combining tall waterfalls, peaceful ponds, a good viewpoint into the wilderness, and even a few bogs into one exciting trek. The trail rises at mostly easy grades, with one very steep and rough section as it ascends the slope next to the cascades. The Nancy Pond trail begins just south of Crawford Notch. The trail begins as an easy dirt path which climbs at a moderate, constant grade. Not far into the hike, trail crosses Halfway Brook. The trail continues climbing for over a mile before it crosses Nancy Brook, the water source of the Nancy Cascades. The trail on the other side continues along the brook, passing the remains of an old mill, until it suddenly turns uphill onto a relocated section of trail. There are many switchbacks here. After a short climb, the trail descends past large boulders back to the brook. The trail crosses crosses Nancy Brook for a second time, now within viewing distance of the first cascade. The first Nancy Cascade is the largest of the three. It is a delicate, fanning waterfall, and is great to photograph. There are many rocks to sit on, so it's a nice place for a picnic. The trail after this becomes much more difficult. It ascends very steeply, with switchbacks, up the hillside right across from the cliffs of the cascades. Along the climb, the trail passes the second cascade, more of a low-angle water slide, and the third cascade, which requires visitors to step a few yards off the trail and can easily be missed. When the trail finally gets past the cascades after 0.4 miles of relentless climbing, it enters a very beautiful forest and follows Nancy Brook across a gentle plateau. After winding through a series of bogs and crossing the now tiny Nancy Brook, the trail arrives at serene Nancy Pond. From the wetlands surrounding its shores, you have a good view of Mt. Anderson. The trail continues over more boardwalks, passes an open bog called Little Norcross Pond, enters the Pemigewasset Wilderness, and arrives at the hike's last destination, Norcross Pond, one of the most beautiful ponds in the region. Norcross Pond is larger than Nancy Pond, and has magnificent views across its waters to the Twin Range. Following the trail along the shore to a beaver dam at the outlet yields a more spectacular vista of the range.